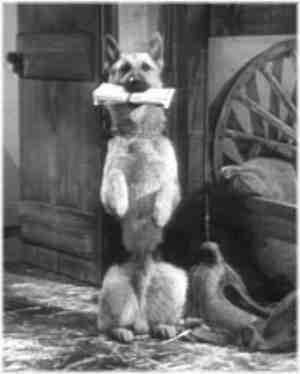 Bullet The Wonder Dog was a character on the television series “The Roy Rogers Show” (1951 – 1957). 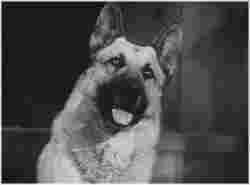 In real life the German Shepherd that played Bullet had the same name, and was also a family pet that was owned by the show’s married stars, Roy Rogers and Dale Evans. “The Roy Rogers Show” was an action-packed Western with plenty of things for a good, honest, dog like Bullet to do. Bullet was a master at knowing who the bad guys were, and always eager to bite a gun out of their hand or to tackle them when his human partners were outnumbered. He could run alongside Roy’s horse Trigger and keep up no matter where they went, but he also got to ride in Pat Brady’s Jeep, Nellybelle. Bullet himself probably lost count of all times he untied Roy or Dale when they had been caught by villains, and of all the bad guys he led them to. To see pictures of Bullet, please scroll down. In a season 1 episode of “The Roy Rogers Show” titled “Desert Fugitives” Bullet finds some important missing papers. Also from the season 1 episode “Desert Fugitives,” Bullet receives an award giving him the honorary title of Deputy Sheriff. 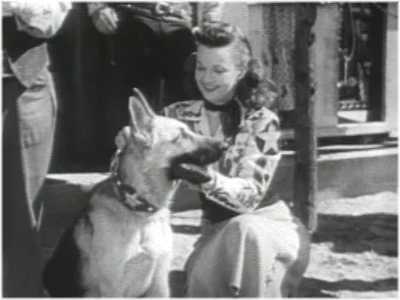 Dale Evans is putting a special collar on Bullet. 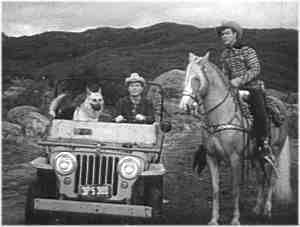 Photo from a season 1 episode titled “Haunted Mine Of Paradise Valley.” Bullet is going along with Pat Brady (driving the Jeep Nellybelle) and Roy Rogers (on his palomino stallion Trigger) to investigate a mine where some bad guys may be hiding. This close-up of Bullet is from a season 5 episode titled “Ranch War.” Bullet is looking intently at Pat Brady as Pat discusses fatherhood.